It's been a little quiet of late for me on the blog front and with good reason. It's a simple matter of time management. I could manage all that I wish to endeavor if only the day was 128 hours long, and I required a mere 15 minutes of sleep. Focus is in short supply often times with me. Unless the subject matter is engaging enough to flip the tables into Hyper-Focus which is what has taken place this summer and fall. It's not the first time this has happened too me. As a Sophomore in high school I became hyper-focused on girls. As a businessman I became hyper-focused on golfing. As a aspiring foodie I became hyper-focused on ultra fine Tequila. Now as an accomplished home cook/foodie/google researcher I've become hyper-focused on making fine hand crafted chocolate. 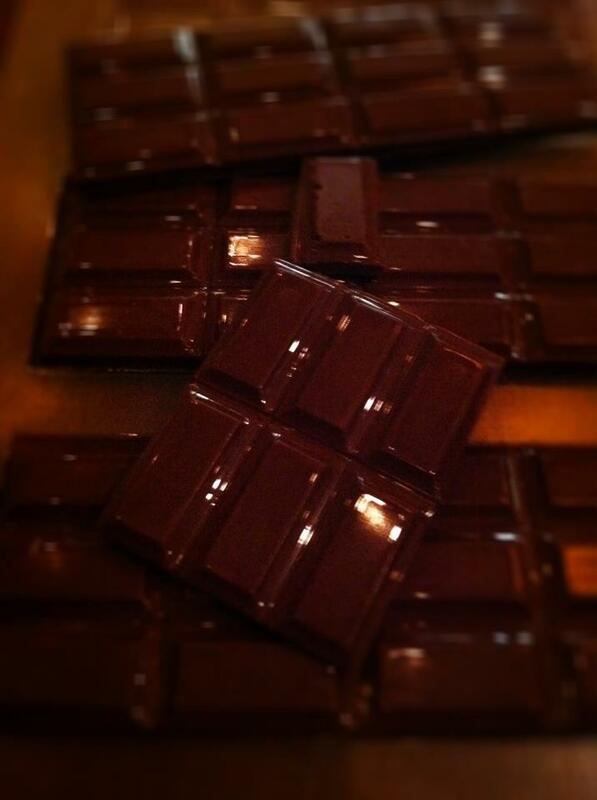 We roast, winnow, refine, conch, temper and mold our own chocolate now. Just buying chocolate isn't be good enough for me anymore. I had to know how its done and then do it myself. A thirst for knowledge foodie coupled with a desire to focus on a craft can lead to some ambitious endeavors. With Michelle's enthusiastic blessing Foodie Spot time has been transferred into Tejas Chocolate time. What started as making something personal for our friends and family has now blossomed into a start up business. I bought some gadgets-made some shade tree mechanic gadgets-bought some cocoa beans-made some chocolate. Thought is was pretty decent. Some of the homers thought so too. You can learn more about our process here. I registered @tejaschocolate and within a week people in Texas wanted to know what the heck I was doing. @kitchenincubator was the first to connect. She wants locally made chocolate for their various catering clients. And just like that Tejas Chocolate was getting more questions, encouragement and interest. There are some well established artisan beans to bar makers around the country but apparently not one found in Texas. The businessman/foodie in me sensed opportunity and that's what the heck is eating up my time. Research, trial, and ERROR, and details that challenge my Big Picture mentality. But the art of manufacturing chocolate from single origin cacao snapped me into a hyper-focus not seen around these parts before. There is an inner spirit pulling me deeper and deeper into the mysteries of making chocolate. The growing regions, the cacao varieties, the plight of the farmers, the subtle flavors of beans, and the craft of producing something so rich all have me mentally engaged. Tejas Chocolate has also inspired me to renew and broaden my connection with the roots of Texas. There couldn't be a better name for us. Tejas is the Spanish spelling of "Taysha" which was learned from the Caddo Indians. Tejas means friends & allies and ultimately defined what Texas means today. What started out as a chocolate project for our friends and allies is now becoming an attempt to build a small business around a fine chocolate and brand. We are getting close to our first official release. We just delivered an order from a Houston law firm for 60 bars for their office party. The first time money will flow to me from a law firm instead of the other way around. If that isn't sign I don't know what is.